Earning a degree requires a substantial financial commitment, and that starts with the application process. On average, universities and colleges charge $75 for application fees, and these do not guarantee acceptance. Some schools offer application waivers to offset application costs, but most do not. The Common App system includes over 800 schools across the U.S. and in 20 other countries. Schools that prioritize affordability and strive to offer a notable return on students’ investment often waive online application fees, allowing qualified students — including transfer and international students — to apply for free. Many schools use the Common Application to further simplify the application process. This allows students to enter their information in one universal form to apply to multiple universities and colleges. Currently, the Common App system includes over 800 schools across the U.S. and in 20 other countries. The site includes an easy-to-use filter system to identify the most ideal colleges and universities. The Common App also assists students in managing deadlines and the admittance progress. Regarded as a pioneer in coeducation, Valparaiso University has provided higher education coursework to men and women for 160 years. Students striving to earn a bachelor's or master's degree can choose from over 110 programs. Valparaiso also offers two doctoral degrees and a law program. The university's undergraduate teaching program is particularly esteemed. Students can complete coursework either on campus or online, and Valparaiso's distance programs offer both accelerated and hybrid options. Valparaiso strives to offer a global education for students in all fields of study. The institution's global study centers offer courses in China, Costa Rica, England, and Germany, and maintains partnerships with many other schools around the world. Valparaiso uses the Common App, and does not charge application fees for U.S. or international applicants. While the university retains accreditation through the Higher Learning Commission, Valparaiso also holds multiple programmatic accreditations. Located just outside downtown San Antonio, Texas, Trinity University is recognized as one of the best universities in the state. Trinity University offers over 100 programs, including particularly noteworthy degrees in teaching, business, and engineering. Trinity University emphasizes qualitative interaction between students and professors, so average class sizes offer a 9-to-1 student-faculty ratio. As a traditional, on-campus university, students gain access to a vast network and community. In just the past year, Trinity students engaged in over 100,000 hours of volunteer work. Trinity University strives to ease the cost of tuition by providing multiple merit-based scholarships, which can cover up to $104,000 over four years. Viable candidates must satisfy additional GPA and test score requirements. Applicants may apply using the Common Application, and Trinity University does not charge application fees for domestic or international students. Trinity University holds regional accreditation through the Southern Association of Colleges and Schools. For more than 160 years, St. Bonaventure University has offered higher education coursework in Allegany, New York. SBU features nearly 50 bachelor's programs, including nine combined-degree and early assurance programs. Students seeking an advanced degree may choose from one of SBU's 20 master's degrees. Traditional students also gain access to an active residential environment, which includes intramural, co-curricular, and community service activities. SBU emphasizes real-world experience. In fact, 90% of students participate in at least two field experiences or internships by their senior year. Though known for their traditional, on-campus courses, SBU also offers multiple online programs, which provide students with the same quality instruction and do not include any in-person attendance. Aspiring students may submit applications online or through the Common App for free. SBU extends this offer to both domestic and international students. SBU also strives to make earning a degree more affordable. Students may qualify for up to $24,000 in merit-based awards per year. Named after the only president born in Missouri, Truman State University is a top-ranked school where students can earn affordable degrees. Truman automatically considers all students for competitive scholarships upon admission. However, students may also apply for multiple merit-based scholarships, which recipients may renew each year. Truman welcomes international students to apply. Nearly 85% of international applicants receive some level of scholarship assistance from the university. Truman holds national recognition for its esteemed liberal arts program, which emphasizes essential skills such as critical thinking, statistics, and public speaking. The program also encourages modes of inquiry and interconnecting viewpoints. Among available degrees, Truman's education program holds particular esteem as one of the top-ranked programs in the Midwest. To apply, students may complete Truman's online application or a Common Application. Neither international nor domestic students must pay to apply. Founded in 1899, Simmons University holds recognition as a pioneer in liberal arts. The university consistently earns recognition as a top school in the northern U.S. In fact, the Simmons School of Business holds first place in resources for women and gender leadership. Though originally intended as a school for women, the university now offers a coeducational experience. Students can access over 60 programs at the bachelor's and master's levels. On-campus programs follow traditional semester structures, but Simmons also accommodates professionals and nontraditional students through its accelerated and online programs. As a private institution, Simmons emphasizes meaningful interaction between students and professors. Therefore, class sizes offer a 12-to-1 student-faculty ratio. Simmons strives to make higher education accessible. Both domestic and international students may apply for free by completing the online or Common Application. Furthermore, Simmons automatically considers admitted students for merit-based scholarships that could cover full tuition. Established just outside of Omaha, Nebraska, Creighton University offers a robust college experience emphasizing Catholic and Jesuit faith, community involvement, a global perspective, and academic rigor. Creighton prioritizes meaningful interaction between students and professors. Though 8,400 learners attend Creighton each year, class sizes boast an 11-to-1 student-faculty ratio. Creighton offers over 140 programs at the bachelor's and master's degree levels. Other advanced programs include its schools of medicine and law and doctoral programs.Most students engage in volunteer work and internships during their studies, allowing students to build their resumes prior to graduation. Creighton boasts a 99% success rate for graduate employment within six month of program completion. Traditional students gain access to over 200 student organizations, plus a career center and academic support. Creighton also strives to support nontraditional learners through distance coursework. Aspiring students around the globe may apply to Creighton University online or through the Common Application for free. Whitworth University offers a private education based in Spokane, Washington. The school does not require students to attend chapel, but Whitworth maintains affiliation with the Presbyterian Church, and strives to meet students' spiritual needs. Whitworth offers 60 degrees at the bachelor's and master's levels to over 3,000 students each year. With an 11-to-1 student-faculty ratio, students build meaningful relationships with their professors. Whitworth also prioritizes student success through its educational support services, academic coaching, and career services. Outside the classroom, the university offers students ample community service and internship opportunities, which can bolster their employment opportunities. Whitworth also emphasizes global awareness; nearly 50% of students engage in study abroad experiences during their program. While many Whitworth students follow a traditional path, the university strives to accommodate nontraditional learners. Students considering advanced degrees may complete their coursework completely online. Whitworth also offers multiple scholarships and free applications through the Common App to assist students who demonstrate financial need. Positioned just outside downtown Peoria, Illinois, Bradley University offers a residential college experience. As the university strives for academic excellence, Bradley holds regional accreditation through the Higher Learning Commission and 21 other national accrediting agencies. For instance, the Foster College of Business at Bradley University retains AACSB International accreditation, an accolade held by less than 2% of business schools globally. Bradley University holds eight colleges and schools, offering 185 programs. Bradley students enjoy relatively small class sizes, with an average student-faculty ratio of 12-to-1. However, students gain access to an alumni network of over 70,000 members. Bradley encourages a global perspective through both short-term and extended study abroad programs. While many students engage in on-campus coursework, unconventional students may also enroll into Bradley's online programs. Bradley University welcomes both domestic and international students. Applicants may qualify for multiple scholarships. Bradley does not charge application fees. Established as a private, Methodist school in Berea, Ohio, Baldwin Wallace strives to challenge and support students both academically and spiritually. BW offers over 80 degrees, but its neuroscience program stands out among the others, boasting international distinction. BW holds multiple programmatic accreditations, maintaining regional accreditation through the Higher Learning Commission. Most students engage in traditional, on-campus coursework. Outside of the classroom, students can access service-learning projects and local internship opportunities, or explore faculty-led international experiences. However, BW's online campus accommodates nontraditional learners who require flexibility. These students can engage in hybrid or fully online program formats. BW also participates in outreach programs to provide opportunities for underserved populations, and students who require financial assistance. BW offers multiple scholarship opportunities that could cover full tuition. Physical applications incur a $25 fee, but domestic and international applicants may apply online or through the Common Application for free. Located in Seguin, Texas Lutheran University students engage in rigorous college coursework presented through a Christian perspective. Founded in 1891 as a private liberal arts institution, TLU currently offers 27 majors on top of three graduate-level programs. The school holds regional accreditation through the Southern Association of Colleges and Schools Commission on Colleges, plus programmatic accreditation for its education, business, athletic training, music, and nursing programs. TLU strives to accommodate high-performing students who would prefer a private learning experience. Currently, 98% of TLU students receive some sort of financial aid. The TLU Promise guarantees at least $20,000 for a maximum of four years for students who hold a 3.6 GPA. TLU also allows both international and U.S. students to apply for free through the university's online application or through the Common Application. Founded in 1871, Ohio Northern University provides a private, rural education in Ada. Ohio Northern University emphasizes personal growth, global awareness, and civic engagement. The university retains affiliation with the United Methodist Church, and Ohio Northern University also welcomes students of all faiths, striving to provide spiritual, ethical, and moral growth. The five colleges at Ohio Northern University offer over 70 majors at the bachelor's level, plus several master's programs. Outside of the classroom, students can join any number of clubs and recreational activities. Ohio Northern University also provides career planning and academic support services to bolster student success. Students may also engage in volunteer, internship, and study abroad programs. Ohio Northern University considers the financial investment of a college degree, and strives to reduce students' loan debt. Therefore, the school offers multiple scholarships covering up to $19,000 per year. Also, Ohio Northern University does not charge an application fee. Cazenovia College offers students a private education in rural New York. As one of the oldest independent colleges in the country with just over 900 students, Cazenovia College students receive an engaging, hands-on education. In fact, average class sizes maintain a 10-to-1 student-faculty ratio. Students access over 35 programs at the bachelor's level. Despite students' chosen fields of study, most Cazenovia learners complete at least one internship during their program. Outside of the classroom, Cazenovia College encourages civic engagement and leadership. For instance, the Cazenovia Alternative Breaks program allows students to complete experiential learning about current issues including hunger, racism, and the environment. Cazenovia College strives to provide an affordable education. Nearly every student receives financial aid, and 60% of learners' aid covers full tuition. However, students who require additional funds -- including transfer students -- may qualify for multiple Cazenovia scholarships. Also, Cazenovia College does not charge an application fee. Carroll University emerged in 1846 as Wisconsin's first four-year postsecondary school. With over 95 bachelor's degrees and multiple programs at the master's and doctorate level, students gain access to an education that can jumpstart their career. Nestled in the city of Waukesha, Carroll University encourages community engagement. Students regularly participate in service and volunteering projects, as the university maintains relations with over 40 local organizations. Each year, students log over 14,000 service hours. Carroll University has also gained recognition as one of the top five schools for participation in overseas programs. Carroll University maintains a tradition of providing affordable education to all students. Nearly all students receive financial aid. However, Carroll University provides multiple renewable scholarships covering up to $22,000 per year. Carroll University also offers scholarships to transfer and international students. Carroll University does not charge an application fee. Students may apply online or through the Common Application. Cedar Crest College offers a private education in Allentown, Pennsylvania. The college initially targeted women, but has since opened enrollment to men, too. With over 150 years of experience, Cedar Crest offers more than 40 majors, including a top-ranked social work program. The college boasts a 10-to-1 student-faculty ratio, through which learners benefit from mentorship in addition to classroom and hands-on experience. Allentown offers multiple opportunities for volunteer work at shelters and other facilities. Furthermore, Cedar Crest holds accreditation through the Council on Social Work Education, plus regional accreditation through the Middle States Commission on Higher Education. Cedar Crest welcomes all applicants, including transfer and international learners. The college also offers notable tuition assistance to offset the cost of students' investment. Prospective students may apply to the college for free. Nestled in Sioux Falls, South Dakota, Augustana University is the oldest higher education institution in the state. Augustana earned its name from a pertinent document of Lutheranism, but stakeholders affectionately refer to the university as "Augie." Augustana affiliates with the Lutheran faith, but students of all faiths may attend. Currently, Augustana offers over 100 programs to thousands of students from nearly 40 countries. In addition to academic rigor and excellence, Augustana promotes cultural sensitivity and global awareness. The university offers internship, research, and study abroad opportunities, allowing students to acquire real-world experience prior to graduation. Recognized as a top-ranking school for value, students enrolled at Augustana receive a solid return on their investment. The university offers merit- and need-based financial aid to 100% of its students. Students may apply to Augustana University online or through the Common Application for free. Overlooking downtown Waterville in Maine, Colby College offers a small, private college experience. Unlike most traditional institutions, Colby follows a 4-1-4 school calendar, breaking from classes for the month of January. This schedule allows students to explore career options, pursue an in-depth study of one course, or conduct research. Most of Colby's 54 majors offer flexible coursework, including independent study programs. Many students also engage in internships, or Colby's study abroad programs. The college's student body represents over 70 countries, and nearly all U.S. states. In addition to global awareness, Colby College also actively supports sustainable practices. The institution holds 16 certifications from Leadership in Energy and Environmental Design (LEED), and its recent renovation of a nearly 13,000-square-foot hall resulted in the college's first platinum certification. Colby College acknowledges that earning a degree requires a substantial financial commitment. Through the Colby Commitment, 100% of students acquire their degrees without student loans. Furthermore, Colby College does not charge an application fee. Le Moyne College offers a suburban, residential college experience in Syracuse, New York. The college prioritizes meaningful and engaging interaction in classroom environments. Classes maintain a 13-to-1 student-faculty ratio on average, and the college offers over 30 majors at the bachelor's and master's degree levels. School values include cultivating compassionate, ethical, and morally just professionals. Le Moyne College provides extracurricular volunteer opportunities, and professors often incorporate service projects into their curricula, as well. Le Moyne College also advocates for environmental sustainability. The school's science facility allows students in health and science programs to conduct ongoing research. The facility includes solar heating and thermal storage, which earned the college a LEED-Gold certification. Le Moyne offers multiple scholarships providing up to $100,000 in aid over four years. The college also does not charge an application fee. Located in Alliance, Ohio, the University of Mount Union has gained recognition as one of the top colleges in the Midwest providing students with a great return on investment. Representing over 28 states and nine countries, students gain access to a culturally enriched campus environment and a global alumni network. University of Mount Union offers multiple master's programs and nearly 60 bachelor's degrees. Most students complete coursework on-campus, but University of Mount Union also strives to accommodate nontraditional learners through online coursework. The majority of students at the University of Mount Union receive federal student aid. However, the university also provides multiple scholarships covering full tuition. As Mount Union encourages global awareness, it also offers six study-abroad scholarships to offset costs. Applicants may submit their admissions materials for free online or through the Common Application. Clarkson University offers a hands-on college education in Potsdam, New York. Students can enroll in any of 60 bachelor's and master's programs, including noteworthy bachelor's degrees in business and engineering. Students seeking master's degrees may consider Clarkson's MBA or civil engineering programs, which also boast high regard. Clarkson holds regional accreditation through the Middle States on Higher Education, and holds multiple programmatic accreditations to bolster graduates' marketability. Clarkson also values global awareness, as the student population represents nearly every state in the U.S. and 65 countries. Furthermore, Clarkson offers 55 international university exchange relationships, which allow students to study abroad. Many traditional students engage in on-campus coursework, but Clarkson also strives to meet the needs of nontraditional and distance learners through online coursework. Students demonstrating financial need may qualify for multiple scholarships from Clarkson. Prospective students may apply online or through the Common App for free. Established in 1818, St. Louis University remains the second-oldest Jesuit higher education institution in the country. As a mid-size school, St. Louis University serves nearly 13,000 students, and represents every state in the U.S., plus 78 other countries. Students gain access to a vast alumni network spanning 150 countries. St. Louis University offers 90 programs at the bachelor's level and over 100 master's degrees. St. Louis University also strives to accommodate nontraditional students through accelerated bachelor's-to-master's degrees, dual degrees, and fully online programs. St. Louis University also features a campus in Madrid that allows students to receive the same quality coursework, even while overseas. St. Louis University acknowledges the financial commitment each student makes to earn their degree, and strives to offset those costs by providing scholarships. Scholarship categories include incoming freshmen, merit-based, competitive, and faith-based awards. St. Louis University does not charge an application fee. Located in Ohio, the University of Dayton offers a private postsecondary education to nearly 8,000 undergraduate and 2,600 graduate students. At almost 170 years old, the university boasts recognition as a highly efficient research powerhouse, and the top Catholic university for research and development engineering. Furthermore, the University of Dayton continues to establish partnerships with leading organizations, providing students access to valuable networking opportunities. The University of Dayton strives to simplify the degree process for all students. While many students engage in on-campus coursework, nontraditional learners benefit from hybrid or online program opportunities, which do not require in-person attendance. The University of Dayton also offers joint and accelerated programs, allowing students to complete their degrees more quickly. Additionally, the University of Dayton offers locked tuition rates, textbook assistance, and multiple competitive and merit-based scholarships. Students may also apply online or through the Common Application for free. Positioned in the heart of Chicago, DePaul University offers degrees at all levels to nearly 22,500 students, while maintaining a 15-to-1 student-faculty ratio. DePaul offers 305 bachelor's and master's degrees across 10 colleges and schools, including DePaul's nationally ranked college of business, one of the top 10 oldest business programs in the country. DePaul also encourages civic engagement, contributing to its surrounding community and allowing students to gain relevant professional experience. DePaul students complete over 3,4000 service-learning hours each year. They also gain access to thousands of internship opportunities, and a nearly 120,000-member alumni network. The student population represents all 50 states, and over 114 countries. DePaul welcomes international learners and maintains relationships with over 30 countries, allowing students to study abroad. Many students receive financial aid, but DePaul also offers over 33 million dollars in scholarships each year. Students may apply for free online or through the Common App. Baylor University stands near the banks of the Brazos River in Waco, Texas. The oldest university in the state, Baylor offers over 140 bachelor's degrees, 75 master's degrees, and 41 doctoral programs. The institution emphasizes critical-thinking and analytical skills, which have earned the university a reputation for cutting-edge research and innovation. Baylor faculty focus their research on issues related to social justice, economic development, healthcare quality, poverty, and sustainability. Every department at Baylor engages with the community, partnering with leading organizations such as the Howard Hughes Medical Institute, which allows students to gain real-world experience and create impact. Baylor holds accreditation from the Southern Association of Colleges and Schools Commission on Colleges, plus multiple programmatic accreditations. To enroll, students can apply through Baylor's online application, ApplyTexas, or the Common Application. Both domestic and international students may apply for free. Tulane University emerged as a public medical college in New Orleans, Louisiana over 180 years ago. Since then, Tulane has grown in programmatic offerings and quality, boasting its membership with the Association of American Universities, an organization that recognizes top-ranked institutions. Tulane offers 70 majors across five schools. Though a large university, class sizes do not exceed a 21-to-1 student-faculty ratio, on average. Outside of the classroom, Tulane students remain exceedingly active in the community, logging over 780,000 civic hours each year. With a student population representing every state in the U.S. and 58 other countries, global awareness remains a core value at Tulane University. While many students receive financial aid, Tulane strives to limit students' debt. Therefore, students may apply for multiple competitive or merit-based awards to offset the cost of tuition. Furthermore, Tulane does not require an application fee. Alvernia University emerged as a Catholic teacher's seminary in Reading, Pennsylvania. Since opening its doors in 1958, Alvernia has expanded rapidly, now offering over 50 bachelor's programs and multiple master's and doctoral programs. Alverina's curriculum emphasizes real-world experiences to prepare students for their careers. Most students complete multiple internships, research projects, field experiences, clinical assignments, or study abroad programs during their degrees. Alverina also encourages students to create local impact, which has earned the school recognition through the Carnegie Foundation for Community Engagement. Alverina also remains one of the top five universities in Pennsylvania to earn the President's Higher Education Interfaith Community Service Honor Roll from the National Community Service and U.S. Department of Education. Acknowledging the financial commitment each students makes, Alvernia strives to offset tuition costs through multiple scholarship opportunities. For instance, the Alverina Reading Collegiate Scholars Program offers full tuition scholarships, along with mentoring and tutoring support. Furthermore, students may apply to Alvernia at no cost. 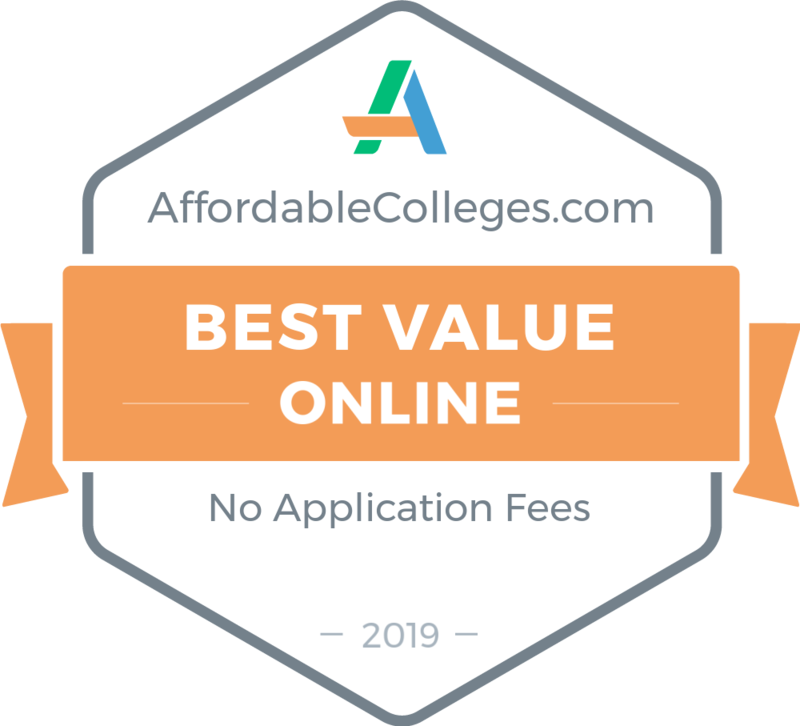 Our methodology considers regionally accredited colleges and universities that do not charge application fees for U.S. or international students. The schools included also use the Common App, which allows students to apply to their prospective universities with ease. We used the Common App website to filter schools that waive application fees for online applicants. The ranking also examines schools for their overall value, which includes their overall academic quality, their cost of attendance, and how much financial assistance they provide. The methodology utilizes in-state tuition to determine value. Financial assistance includes need-based, merit-based, and competitive scholarships.